This is an important device for any building where high safety is needed. Devices to reduce risk can be designed and installed such as High Security Bollard which is designed to set Standoff Distance between building and Vehicle Bomb Threat or Car Bomb in order to reduce damages to building, especially to building structures. It can be called a perimeter security. The bollard security standard must be followed. Bollard has many work functions. For example, it can be moved by hand, it can be fixed permanently (Fixed Bollard, Static Bollard), it can be driven by Pump Hydraulic (Pop Up Bollard) or it can be installed by shallow mount. 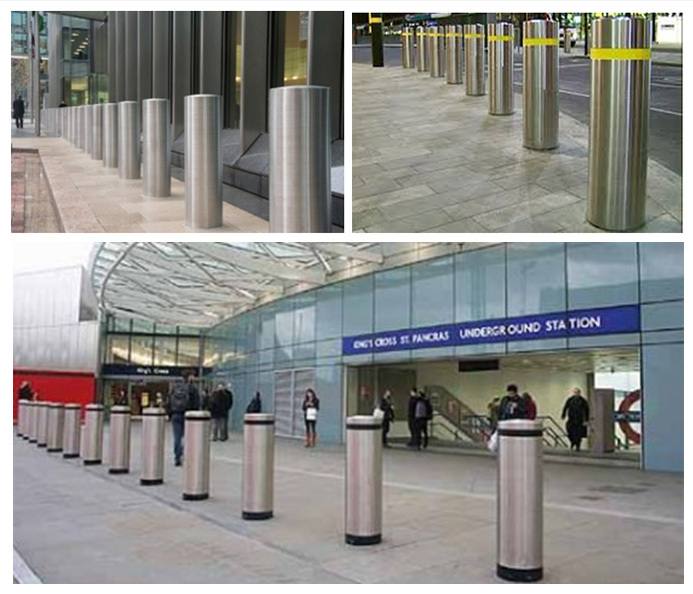 The advantage of having many types of bollard to choose is that it can fit each type of area. Bollard should be certified with Bollard test standard that widely accepted around the world namely PAS 68 or ASTM standards. The test is done by having a bollard hit by 7,500 kg truck at speed of 48, 64 and 80 km/h. When choosing the bollard model, type of car, weight and speed that may hit the building must be considered. When the bollard is crashed, it must stop the hit as specified. With the strength of bollard, it can protect the building. The exterior of bollard is harmonious with the landscape. People and car can pass around as usual. The bollard has no effect on the scenery and is also easy for maintenance. In addition to the normal version, there is a version called Shallow Mount. This is permanent bollard. It is easy to install because it drills the floor down to at least 15-20 cm and it is as strong as general model because it is also certified with PAS 68 or ASTM standard. High Security bollard that has Crash Rated (High Impact Vehicle Barrier) is the best choice for important buildings such as data centers, banks, embassies, palaces, or ancient sites that are important and require high security.